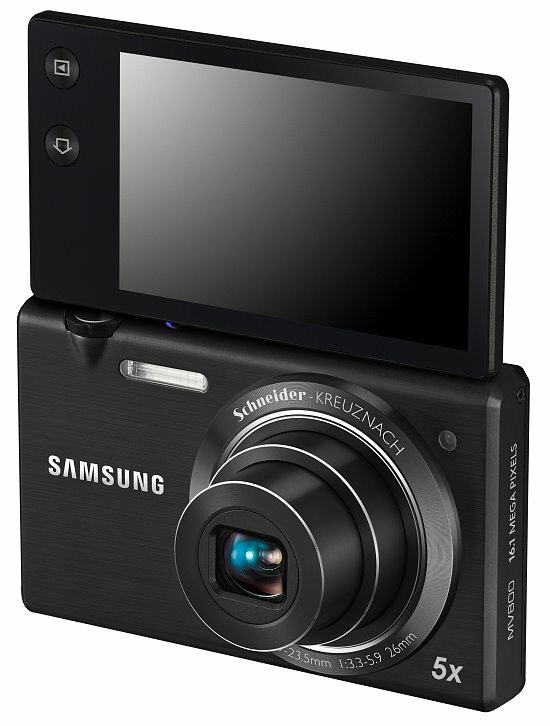 Samsung continues to create some extremely fun to use cameras, and the MV800 is no exception. This stylish camera is loaded with fun to use settings, and the hinged LCD is sure to be a hit among the social crowds. We did find a few shortfalls with the camera, but overall it gets a good recommendation from the staff here at Steve's. Read more in our Full Conclusion. Samsung continues to create innovative consumer products, like their Dual-View cameras. Samsung has taken the ideals behind their Dual-View cameras and created the all new MV800. MV stands for Multi-View, and that's the idea behind this sweet little pocket camera. While the Dual-View cameras continue to be some of the most popular Samsung has made, the MV800 takes a slightly different direction. While still offering the ability to see yourself and your friends when pointing the camera towards you with one hand, instead of having to frame with a small LCD on the front, you now can use the huge flip-up 3.0-inch LCD display from the back of the camera. This unit tilts up only, giving you a nice, easy to see display for framing. The Dual-View cameras are handy none the less, however due to the lens on the front of these cameras, Samsung is always limited with the size of the front screen due to a lack in real estate. With the MV800's design, that's no longer an issue. Other important features on this camera include a 3.0-inch touchscreen LCD display, an all metal body, App style GUI (similar to a modern day smart phone), 16-megapixels of resolution, a 5x optical zoom lens, Dual IS (optical + digital), additional shutter button on the rear when the 3.0-inch display is facing forward, etc. The MV800 is available now with an estimated street price of $249 USD or less. See our buy box below for the most current online pricing from various vendors.